While being aboard a transatlantic ship, German woman Liza notices someone who looks like Marta, the former inmate at Auschwitz, where Liza used to be the guard. Q: Why isn't this fantastic film available on dvd for purchase or rental and when will it be? Shirley Clarke is one of those filmmakers I've heard about but I never seen any of her films, until now. In New York at this time Cassavetes and many other filmmakers were doing films outside of the Hollywood system and tried to tell a different kind of film. 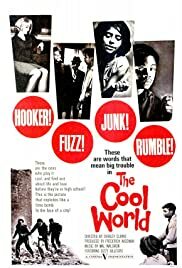 Shirley Clarke was definitely a part of this filmmovement using and deploying the same kind of style, tone and content. This socialrealistic, gritty, dramadocumentary about street life in Harlem in 60's seen from a very young African American male by the name of Duke who joins a gang called the Pythons and starts waging a war against a rival gang called the Wolfs, is interesting albeit very flawed film experience. At times this film is reminiscent of Cassavetes but being a very flawed film, the use of stock footage, voice-over, improvisational acting, etc means that Clarke sometimes ends up being a protegé to b-moviemaker Doris Wishman. It may seem odd that I'm comparing the two but at times these two filmmakers seem to have a lot in common. At best this film comes across as very dark, realistic portrayal of inner city youth crime in 60's. The film doesn't shy away from drugabuse, prostitution, interracial relationships etc. Strangely, this film hasn't been released on DVD nor have Criterion, Masters of cinema etc released her films in a DVD box. Shirley Clarke should get that treatment, she deserves it. And this film should be seen by more people interested in early American independent cinema.